Hello thoughtful, friend! You are such a sweetheart for wanting to gift your clients something special! You appreciate them for choosing you and want to foster a positive relationship right from the start. You decide to build your brand through sending client gifts. But what is that something special? How do you celebrate them with a gift they’ll love while representing your brand? Let’s start with why it’s important to send a gift that’s on brand to foster a positive client relationship. Your clients hired you for a reason. They like you and what you have to offer and expect to see a certain style from you. We are all attracted to strong brands as they’re easier to predict and rely upon, so gifting something that is “on-brand” will only nurture your clients to trust you even more. And should a dilemma arise for whatever reason during the course of your relationship, a thoughtful gift could proactively alleviate the issue from ever escalating. If your brand was a _______ what would it be? You were most likely encouraged to ask questions such as this when going through the branding process, and we can definitely use the same question to design a branded gift your clients will love! 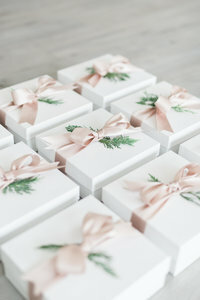 If your brand was a gift box, what would it be? Is it one of luxury, that opens smoothly while reflecting a high-gloss finish? Or maybe a beautiful seagrass basket that can be kept for years to come? Does your brand care deeply for the environment and wish to use one made from recycled materials? Or could a magnetic gift box perfect for storing photos and memories best represent your brand? The box, or vessel, is one of the first elements your client(s) will see and feel when receiving your gift, so make sure you don’t overlook this important piece. You want it to look and feel like your brand while reflecting what is most important to you. What goodies represent your brand? This is definitely what everyone focuses on most and for good reason! It’s the heart of your gift! While I believe that what you give is intended for the recipient and should be something they enjoy, the items inside really need to represent your brand, too. Your clients will love receiving a branded gift since it is what attracted them to you in the first place! A branded gift will boost their confidence in choosing you, so I wouldn’t concern yourself with trying to gift something different to each client. Have a gift plan and stick to it. When selecting which items to include, I encourage you to gift a mix of goodies especially if your clients are couples or families. Consider gifting a few treats and thoughtful items or gift cards for memorable experiences/helpful services. Beware of gifting a lot of “stuff.” I am a firm believer in simplicity and never want to clutter someone’s home with tchotchke gifts. Finding a balance between gift goodies to consume and keep is always a good idea. Your clients will surely appreciate your thoughtful gesture! Going back to our question, if your brand was a snack, what would it be? What does it taste like? How is it packaged? There are so many delicious treats out there, but sometimes the packaging isn’t the best fit. Make sure it “looks” like you and the quality matches the level of your brand. If you know of food allergies your client(s) may have, please keep that in mind when selecting edible treats. There is nothing worse than sending a package full of death to a new client. “Oh you’re allergic to peanuts? Here’s a box full of Virginia’s finest with a side of EpiPen.” I joke, but please be cognizant of allergies whenever possible. Are you a French blue silk ribbon that flows elegantly off the package? Or is your brand a perfectly tied satin bow with clean cut edges? Maybe twine wrapped in a simple fashion reflects your brand better, and you grace it with a sprig of freshly cut boxwood. You could attach a gift tag with their names written in lovely calligraphy or maybe adorned with your logo, but whatever you choose make sure it represents the business you are building. Feel the weight of the paper. Choose carefully on the style of calligraphy/font used. Make sure you spell your clients’ names correctly and include a handwritten sentiment thanking them for choosing you. I highly suggest sharing your contact information again and reminding them how to best get in touch with you. When it’s all said and done, does the gift you designed reflect your brand? Is it something that you would love to receive if you were the client? Branded gifts reflect consideration, trustworthiness, and help strengthen positive relationships with your clients. I encourage you to give client gifts and to ask these questions every step of the way, so that you’re not only representing a grateful heart through a thoughtful gift, but a strong, trusted brand as well.